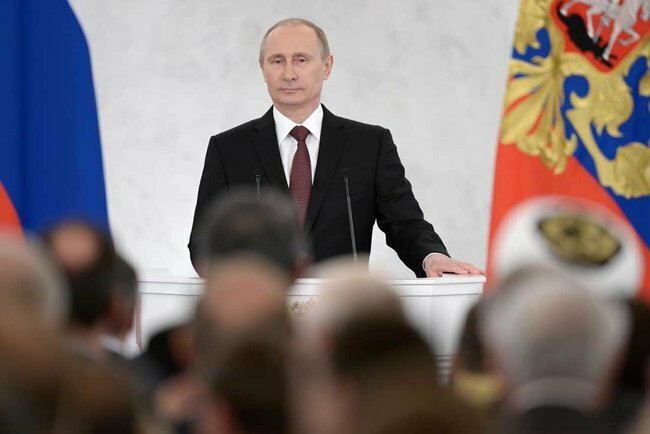 Putin’s press office used this photo to accompany the text of his speech on Crimea. You can see why the Russians love their Putin. You can appreciate his domestic political appeal when you read the speech he gave in the Kremlin on Tuesday. By Tuesday night, the first part of this oration by the president of the Russian Federation had been translated into English and posted online by the Presidential Press and Information Office (http://eng.kremlin.ru/news/6889). Citizens love a leader who forcefully stands up for their own country, refuses to apologize for anything and instead attacks and makes sarcastic fun of his critics abroad. And Vladimir Putin certainly did that as he praised and defended the independence and then the annexation of the Crimean peninsula in Tuesday’s speech. He went into some detail about Russia’s historical connection with the region, even citing Russian military victories there in centuries past. He talked at length about respecting ethnic minorities, especially the Crimean Tatars. He laughed at western invocations of international law in view of United States actions in Iraq, Afghanistan, Libya and other places in recent years.